SMOOTH GROUND WITH HIGH QUALITY EQUIPMENT. EXERCISE IN CHALLENGING AND DEVELOPING THE MIND/BODY CONNECTION. TO IMPROVE FOCUS AND PROMOTE ADVANCED CRITICAL THINKING SKILLS. BALANCING, CRAWLING, CREEPING, SOMERSAULTING, ETC. VERY ADVENTUROUS, JOY, AND AMAZING. LEADERSHIP AND TEAM BUILDING, MOTIVATION, COMMUNICATION ETC. RATHER THAN SPORT, COMMUTING OR EXERCISE. Sieger Outbound Training is the leading experiential education Group in INDIA, with a national network across the country. Our wide-ranging outbound learning offerings occur in the resorts, wilderness, on the sea, in the classroom or a destination of the client's choice. This division have been changing lives through challenge and discovery for more than 6 years by using ourdoor as a classroom to provide unparalleled opportunities for discovery, personal growth, self-reliance, teamwork and compassion. Our programs continue to serve corporate officials, students and individuals with outdoor expeditions and other innovative programming in India's most beautiful natural areas, in classrooms, city parks, in Resorts and boardrooms. Certified and trained outdoor instructors conduct adventures activities based on TNA. The program includes Rock Climbing, Jumaring, Bouldering, Commondo Climbing, Traverse Crossing, Natural Climbing, Wall Climbing, Prasailing, Zorbing, Fire Walking, Glass Walking, Bed on Nail, High & Low Elements, Burma Bridge, Military Obstacle Courses, Treasure Hunt, Lots of Adventures Activities, Corporate Team Games and Creative Exercises. The programs are high energy, impact and lead to excellent team bonding. Sieger expeditionary learning approach is an educational framework that emphasizes high achievement through active learning, personal & professional development and leadership & teamwork – across diverse learning environments. We deliver programs using unfamiliar settings as a way for participants to experience adventure and challenge in a way that helps them to discover that they can do more than they thought possible. It is a methodology that places equal emphasis on development of the character and the intellect. Sieger Outbound Learning can occur nearly anywhere, with nearly anyone: in the classroom; on a grueling mountain ascent; in the post-course debrief, or in the days following a return from the wild. We conducts residential OBT program at various locations in INDIA. These program are designed to meet the specific requirement of the organization / industry. This is a totally structured program where Sieger provides boarding and lodging and Activities along with debrief. What sets SIEGER OUTBOUND TRAINING apart from any other learning experience is the practice that expedition members are “crew, not passengers.” We don’t encourage participants to contribute to the group; we require it. After all, on an Outbound Learning, awareness of others is not optional; it is necessary for success. This idea that “they are needed,” no matter who they are, is a critical ingredient to the success of our Outbound Learning programs. Sieger conducts residential Outbound Training program at various locations in INDIA. These program are designed to meet the specific requirement of the organization / industry. This is a totally structured program where Sieger provides boarding and lodging and Activities along with debrief. Using unfamiliar settings to impel delegates into mentally, emotionally and physically demanding experiences. Utilizing and managing appropriate risk. Facilitating engaging, relevant, sequential experiences that promote skill mastery and incorporate reflection and transference. Learning from success as well as failure. Designing an experience that supports physical and emotional safety. Developing a caring and positive group culture. Demonstrating increased self-confidence and self-actualization. Demonstrating compassion toward others and living a healthy and balanced life. Demonstrating the ability to set goals, and inspire and guide others to achieve them. Demonstrating the ability to collaborate, communicate, solve problems and resolve conflicts effectively. We understands the prerequisites for entrepreneurial success when it values difference, acknowledges effort and encourages participation. Our Outbound Training professionals are from defense, corporate, certified mountaineers and adventure sports with enormous passion for facilitating outdoors programs. We run Outbound Training courses in some of the best locations across the country a destination of the client´s choice. We give highest priority to the safety and well being of its participants. Every aspect of our outdoor activities are carefully and diligently evaluated. Excited When Hanging On From The Top Of The Hill To The Smooth Ground With High Quality Equipment. Trekking In India Is One Of The Finest In The World And It Is Very Adventurous, Joy, And Amazing. Fire Walking Is A Method Of Overcoming Self Limiting Barriers; And Helps To Improve Focus And Promote Advanced Critical Thinking Skills. Walking On Nine Foot Of Smashed Sterile Razor Sharp Glass Pieces Is An Exercise In Challenging And Developing The Mind/body Connection. PARA-SAILING is one of the fastest growing sports in INDIA.. Nothing can beat the feeling of flying high up into the sky amidst the clouds. Our Obstacle Courses Involves Movements Such As Bending, Straightening, Balancing, Crawling, Creeping, Somersaulting, Etc. Well-designed Fun Filled Activities And Exercises For Developing Leadership And Team Building, Motivation, Communication Etc. Come Aboard Catamaran For An Ocean Adventure Unlike Any Other And Experience The Majestic Indian Ocean In A Unique Way. Cycling Adventure For Pleasure, Joy, Adventure And Autonomy Rather Than Sport, Commuting Or Exercise. Experience The Barefoot Walk On Sharp Nails And Over Come The Self Limiting Barrier. Sieger Outbound Training Division is extensively used for residential course. Siegers` certified and trained outdoor instructors conduct adventure and activity based on the TNA (Training Needs Analysis). The typical duration of a residential program is 2–4 days. The program is experiential, interactive and participative so that understanding of ideas and concepts is strong and transfer and retention is effective. 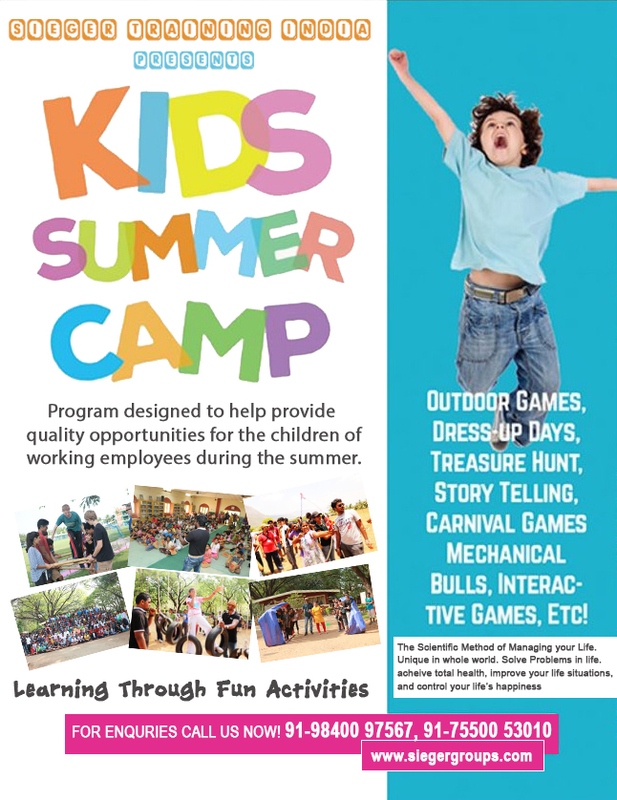 The program includes adventure activities, team games and creative exercises. The programs are high energy, high impact and lead to excellent team bonding. Sieger Training India has come out with an exciting experience for its Non Residential Corporate Outbound Training Services. This structured Outdoor Adventures program duration will be 1 or 2 days and will not cover accommodation but provides activities along with debrief. Siegers` certified and trained outdoor instructors conduct adventure and activities, based on TNA (Training Needs Analysis. Sieger Outbound Training Team has come out with an Open Enrolment Outbound Learning programs to Corporates, Non-corporates, individuals and small groups. First, this can be a scheduled program with a prior announcement from Sieger group for a public enrolment and another one can be an unscheduled program which ideally suits for Seminars, conferences, association meetings, parties and etc. Sieger`s certified and trained outdoor instructors conduct adventure and activity. Individually, we’re passionate about innovating, planning and delivering the best outdoor learning. As a team, we get excited helping our clients choose and experience outdoor events that are right for their needs. We have a great work culture here and love to help our clients by creating top-notch experiences using the Power of Play. Raj as he is known as a dynamic business builder, hands-on leader, and creative solutions provider. His extensive human resources development, consulting and training expertise has been built through a solid mixture of experience as an entrepreneur and as an external consultant to private and public sector organizations. With the total experience of 16 yrs, Raj has trained thousands of Corporate Executives of leading national and multinational organizations through his acclaimed public and private workshops. 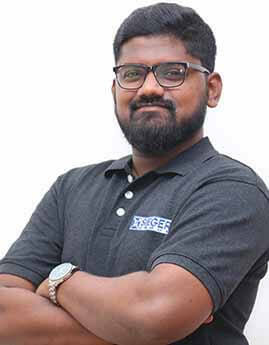 A Management Graduate from University of Madras took him to work with industries that are both Manufacturing and Education and later a passion towards training has left a long lasting impression with the participants. He combines a practical facilitating style with a broad range of management training experience, allied to his personal enthusiasm and sense of humour, to present dynamic and informative program that participating audiences find easy to relate to. Through his participative and interactive program he leads people to develop Communication Techniques, Marketing Strategies and Management Strategies, resulting in their personal growth through outdoor and indoor workshop. Raj was Senior Cadet Under Officer during his NCC days attended more than 18 camps nationally and Possess 'C' Certificate, Grade 'A', RD Candidate, got placed in CRPF through all india competitive examination and trained from CRPF officials. Now, he is expert in conducting Adventures & Obstacle courses which includes, Rappelling, Jumaring, Bouldering, Commando Climbing, Traverse Crossing, Natural Climbing, Burma Bridge, High Rope and Low Rope Courses. He has received overwhelming responses from his clients for his globally renowned Fire Walking and also Glass and Nail Walking with 100% injury free training. With Sieger he handles lot of Outbound Leadership and Team Building Courses along with inhouse workshops as well. He is also specialized in DiSC® Personal Profiling and uses a lot of NLP techniques in his training to make the session more interactive and activity based and maintain High Quality Standards. He is very well known for his Outbound Team Building & Leadership workshops.Raj has handled workshops on many titles viz., Communication, Time Management, Stress, Assertiveness, Presentation Skills, Goal Setting and Attitude Reengineering, Train the Trainer and etc. He is specialized in conducting Leadership & Team Building workshops. He has conducted various programs to enhance the capabilities and match the requirement of today’s competitive global environment. His concepts are practiced in many companies, he has done Outbound training programs to Daimler India, Siemens Ltd, ABB, Polaris, Comstar, Rane, Kone Elevators, Royal Sundaram, ETA Group, TVS, Henkel India, Cholayil, Dodla Dairy, MMF, LG Electronics, Glenmark, Aditya Birla, Cognizant, Turbo Energy, Ford India, IDBI Fortis, Hyundai, Hero Honda, Nokia, Datamatics, BPCL (Bharat petroleum), Micro Devices, HCL, Vedenta (Malco), Jaganath Textiles, Dr. Reddy’s Lab, HSI Automotives, Essilor, Nokia, Anabond Ltd, Saint Gobain, FL Smidth, NMS Works, Bliss Group, Honeywell, Visteon India, Alstom Transport, Chennai Business School, Gitam University, TAFE, Schawk and many more. Kamali, a Certified NLP Business Practitioner, Possesses robust knowledge of Pearson Versant Spoken English and is a BEC trainer. Kamali is a team building success coach that has helped thousands of people form new bonds with her workplace team building interactive activities. Graduated her Master's Degree in Business Administration majoring in Human Resource from LIBA. Kamali is also a Certified Rock Climbing Instructor and has led diverse teams of professionals in learning, content design and facilitated training programs in all major sectors. She has an experience of training diverse cultural, gender and age groups. She is known for her passion in inspiring people to learn with her dynamic presentation style. Her forte lies in her ability to connect with people and to bring out the best in them. Her experience spanned more than 8 years in the areas of training, facilitation, talent management and leadership & Teambuilding through outdoor and indoor. Kamali is specialized in DiSC Personal Profiling, uses lots of NLP techniques in her sessions. She is also known for her Outbound Adventures course like High Rope & Low Rope Course, Rock Climbing, Zip Line, Rappelling, Jumaring, Burma Bridge, Traverse Crossing, Wall Climb and other Team Building & Leadership Program and received great responses from her clients for her Fire & Glass Walking. Kamali's programs stimulate new ways of thinking, challenge self-defeating belief systems, and offer new and powerful choices — all in a gentle, caring, safe, and fun atmosphere…. where the participants come up with the Ah-ha’s! As a person of high motivation, Kamali's goal in life is to support individuals prosper and progress even during extreme stress and unfavorable circumstances and also be a source of positivism and inspiration for the community and colleagues around. She has also facilitated programs with an educational institutions like Chennai Business School, GITAM University, Vaishnav College, SSS Jain, Hindustan, Bharath University, Vels University, SAC MAVMM, PKIET, MCC College, Sri Krishna Engineering College and many more. Thirulogachandaran is INDIA< first Mount Everest Marathon Champion, 2004 and a Certified Mountaineering Instructor. Thirulog completed his Masters degree in Commerce from University of Madras. During his under graduation he was in NCC and positioned Senior Cadet Under Officer and completed his "C" Certificate. He has undergone intensive training during NCC days and appeared BLC, Delhi and prepared for his Mountaineering those days. Now Thirulog is a certified Mountaineering instructor. He has received "A" Grade for Advance Mountaineering course from Himalayan Mountaineering Institute (HMI), Darjeeling, West Bengal, also received "A" Grade for Method of Instruction Course from Same institute. He has also received "B" Grade for Basic Snow Skiing Course in Manali, Himachal Pradesh. Thirulog Climbed Mount Hanuman Tibha, Himachal Pradesh (15,500 Ft) in 1994, Mount Jonli, Uttar Pradesh (21,760 Ft) in 1995, Mount Nehru, West Sikkim (18,500 Ft) in 1997, Mount Kabru Dome, West Sikkim (22,300 Ft) in 2002, Mount Everest Base, Nepal (18,350 Ft) in 2003, Mount Kalapatthar, Nepal (18,550 Ft) in 2004 and Mount Lama Wangden, North Sikkim (20,726 Ft) in 2010. Today Thirulog has become an invaluable Mountaineering instructor and Joined hands with Sieger for Mountaineering course for their clients. He is specilised in conducting ROCK CLIMBING, TREKKING, RIVER CROSSING, FLYING FOX, ZIP LINE, PARASAILING, NATURE STUDY CAMPS, FITNESS YOGA & MEDITATION, ARCHERY, ROLLER SKATTING, MOUNTANEERING EXPEDITION TO HIMALAYAS, MT.EVEREST EXPEDITION. A Graduate Engineer with his passion and interest he has taken his career as an Outbound Trainer. 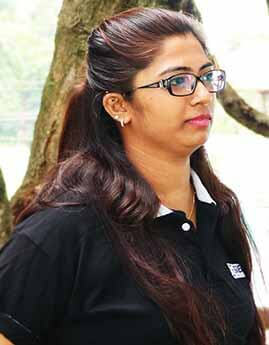 Mani is a leading Personal Fitness Trainer and Mr. Thanjavur before taking this assignment. He is highly inquisitive who explore to learn adventures courses and has currently an outdoor Coordinator, a belayer, who is responsible for safety during adventure programs. 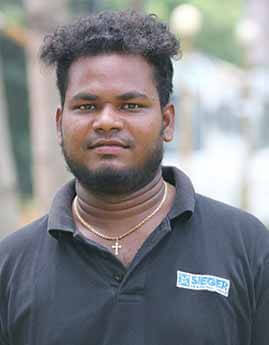 Mani, has maintained 100% safety till date and received overwhelming responses from clients for his initiation. An young and vibrant personality who has been successful till date as a supporting staff for Sieger Corporate Outbound Training programs and assisted many corporates like Visteon India, Daimler India, Renault Nissan, SS Information, Fronius India, Income Tax Department, TI Cycles, Apollo Tyres, C3 India, HCL, Cognizant, SRF Limited, Sundaram Fasteners, DGVC, MCC College, Reydel Automotive, Matrimony.com, Symrise, Steel Strips and many more. As a B.Tech graduate from Jeppiaar Institute of Technology he started his career as a Technical and Entrepreneurship Skills Development Trainer later due to passion turned as an Outdoor Learning Instructor. He is BEC certified and a knowledge shareable person with strong programming skills as well as excellent communication skills. 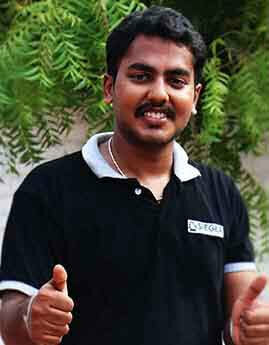 Vishal Jegadeesan expects highest form of quality in whatever work he does. He always wanted to people to become creative professionals rather than to an ordinary personality. He has trained more than 20000 professionals In outbound training out of which 500 school students in the field of robotics and made them excel in various State, National and International Competitions for more than a year. He has a vast experience of more than 4 years in Mobile Application Development and in Web Application Development and has many applications deployed in market under his belt. 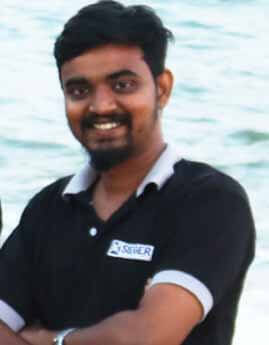 He is also a Software Activist and a dedicated member of Software Foundation of Tamil Nadu (SFTN) working towards the spread of knowledge on the importance of using of GNU/Linux in their homes. He has also conducted lots of workshops, seminars on Entrepreneurship Skills Development Courses like Candle Making, Herbal Product Making, Chocolate Making and lots more. A highly skilled event professional with 7+ years’ experience of planning and delivering a vast array of event types. Think; corporate family days, outdoor events, conferences, seminars, awards (or) ceremonies, exhibitions as well as large social functions, product promotional events……. the list could go on! Aaron career has covered multiple industry sectors and he feel happy to travel to any locations to manage event on behalf of a client. Aaron specialty is full event production, photography, operations and logistics with a true passion and natural flair for the planning and delivery of well executed events. Combined with leadership skills deployed to direct and derive the maximum return from suppliers, team members, key stake holders / accounts and sponsors. He is a results-driven with a meticulous attention to detail and a solid commitment to achieving maximum success for clients, stakeholders and colleagues alike. Chennai - 600073. Tamil Nadu, India.